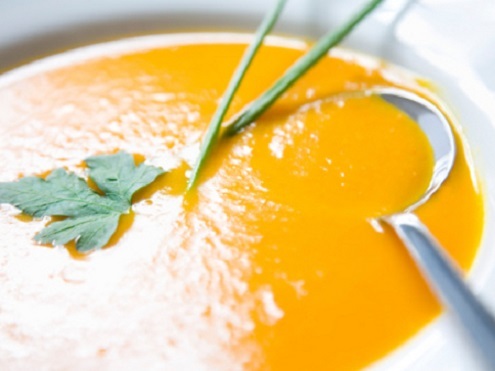 Pumpkin soup, or sopa de abóbora, is one of the most traditional Portuguese soup recipes. It has a sweet and unique pumpkin flavor and smooth texture. The scent emanating from the soup is unbelievable and is quite enjoyable to make for this fact alone. This is a perfect soup for enjoying during the cold holidays as it is a hearty and delicious soup that is simple and easy to make. 1) Peel the pumpkin and carrots and cut them into cubes. Add them to a blender and puree them until they are a smooth and even consistency. 2) Now add them to a saucepan with water along with the minced onion and garlic cloves. 3) Add the tomato, olive oil, and cinnamon powder and stir it well. Bring it to a boil. 4) Once the vegetables are tender and soft then then reduce the heat to a simmer. Add some more water if it is too thick, and cook a bit longer on low heat. 5) Once it is done, add salt and pepper to taste and stir it well. Cover with the chopped parsley and serve. Your recipe caught my attention because we also make pumpkin soup in Malaysia (far away from Portuguese). The ingredients we use is strikingly similar to yours, except we do not use cinnamon. Your’s should carry a more authentic flavor of where you are definitely.